KUALA LUMPUR: A Malaysia-based palm oil giant has been urged to address issues of reported deforestation, forced labour and land grab in other countries, after losing a court case involving a developed ancestral land in Papua New Guinea(PNG). The suit was brought upon customary land owners, indigenous communities, who were against KLK’s plan to develop large areas of ancestral territory and pristine forests in the area. "This victory is extremely important for the nine indigenous tribes within the area which depends on the forests as the basis for economic and survival,” said director of Malaysian NGO Friends of the Orangutans, Upreshpal Singh in a statement. The association urged KLK to “not only pack up and leave Collingwood Bay” but to seriously address deforestation issues of orangutan habitat, child and forced labour in Indonesia, their involvement in land grabbing in Liberia, as was reported by the U.S-based Rainforest Action Network (RAN). "As a Malaysian company, KLK’s reputation of the Malaysian palm oil industry and Malaysia,” said Singh. RAN forest campaigner Robin Averbeck said that KLK should emulate other multinational agricultural companies that have set credible policy examples by pro-actively going against deforestation. “At a time when its peers such as Wilmar (International Limited) are adopting leadership policies as a new benchmark for responsible palm oil production, KLK continues to show blatant disregard for human rights across its global operations. 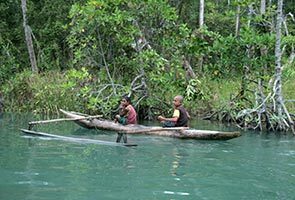 “From Liberia to Indonesia and Papua New Guinea, KLK is involved in the destruction of endangered orangutan habitat to use of child labor to the violation of the rights of indigenous peoples. It is past time for KLK to recognise that business as usual as it has known it is no longer acceptable,” said Averbeck. The matter has caught international attention when Collingwood Bay landowners requested international NGOs to support their formal complaints to the Roundtable on Sustainable Palm Oil (RSPO) against KLK’s activities on their land. In January, the RSPO issued a decision ordering KLK to cease all activities until the legality of leases was determined by the courts and to demonstrate proof that the Free Prior and Informed Consent (FPIC) process carried out involved the whole of the affected community, rather than small pockets of it. KLK is the world's fifth-largest palm oil plantation company with a land bank nearly 250,000 hectares in Malaysia and Indonesia, and is Malaysia's third largest listed plantation company with annual revenues of RM9 billion. Since the late 1970s, PNG has tried to attract investment from foreign agro-business companies to stimulate economic growth and provide job opportunities by issuing Special Agricultural Business Leases (SABLs) to develop land concessions. To date, 400 SABLs covering five million acres (about 2.02 million hectares) have been issued including the one awarded to KLK. However the SABL system has recently came under fire, resulting in a Commission of Inquiry being set up by the PNG government in 2011.